2013 World Championship silver medallist at 5000 Hagos Gebrhiwet of Ethiopia, who turned 21 just four days ago, gave himself a nice birthday present as he took down reigning double Olympic and double world champion Mo Farah of Great Britian to win the men’s 3000 at the season’s-opening IAAF Diamond League track and field meeting in Doha, Qatar. 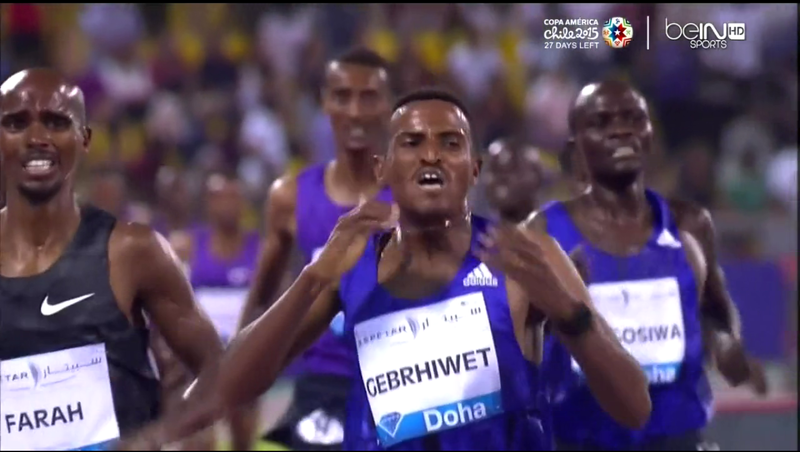 Gebrhiwet used a 54-flat last lap to go from fourth to first and just hold off Farah in 7:38.08 to Farah’s 7:38.22. It was Gebrehiwet’s first career victory over Farah (0 for 3 coming in) and Farah’s first loss on the track since July 2013. Coming in everyone expected Farah to smash Dave Moorcroft‘s nearly 33-year-old British record of 7:32.79, which had stood since July 17, 1982, but no one went with the rabbits as the race was run in 96-degree heat (35.5 Celsius). Farah looked to be in control with 800 meters remaining as he was where he seemingly is in all track races, in front on the rail, controlling a tactical race. He still led as they approached the bell. However, 17-year-old Yomif Kejelcha, the reigning World Youth and World Junior champion at 5000, didn’t follow the normal script. He took the lead just before the bell with a surge that Farah didn’t respond to initially. At the bell, Kenyan Thomas Longosiwa (who would wind up third in 7:39.22) was in second with Farah third and Gebrhiwet second. Kejelcha’s surge proved too be too much too soon as he’d fade over the final 200 and end up fifth in 7:39.99 but it totally shook up the race. Four different men held the lead over the final 450 meters in a wild finish. 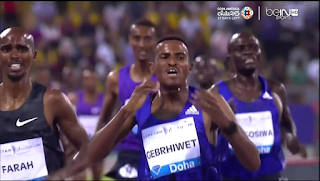 In the end, it was Gebrhiwet who emerged victorious, holding off Farah over the final 75 meters to earn a big win in front of a raucous crowd full of Ethiopian fans.